Long addition is a simple, fairly long winded, but highly useful method of adding multi-digit numbers together. Imagine that we are adding 205 to 876. Firstly, write the numbers above each other. Make sure that the digits of both numbers are clearly aligned according to their place values (i.e. hundreds, tens and units). Leaving a definite space between your columns helps avoid confusion, especially with larger sums. Then, it is as simple as adding the columns. Begin in the units column and work from right to left. In our example, adding 5 and 6 gives 11. 11 can be thought of as 1 ten and 1 unit. The unit is recorded in the answer box in the units column. The ten must be "carried" into the tens column, so the next operation is 7 + 0 + 1 = 8. The eight is recorded in the answer box in the tens column. Finally, we add the digits in the hundreds column (8 + 2 = 10). 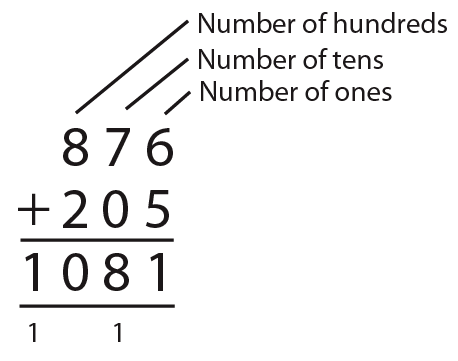 The zero is recorded in the answer box in the hundreds column, and the one is placed in the answer box in a new thousands column. ↑ Properly speaking, this operation is 70 + 0 + 10 = 80. ↑ Similarly, 800 + 200 = 1000. This page was last modified on 24 November 2008, at 21:43.